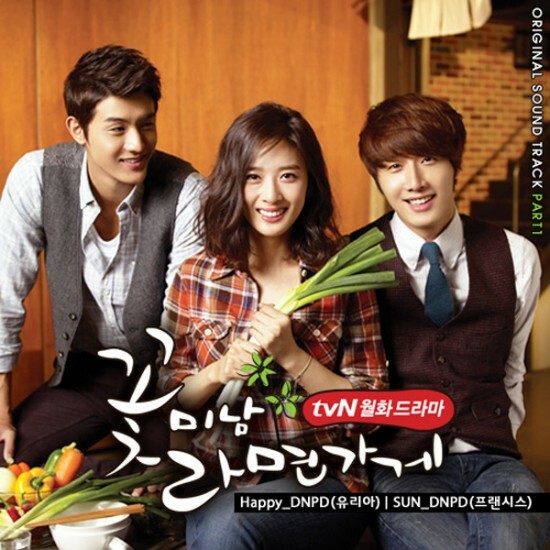 The first part of Flower Boy Ramen Shop (aka Cool Guys, Hot Ramen) OST (original soundtrack) contains two songs, and is released on November 1, 2011, which are sang by two different singers. The second song with the title of “SUN” is sang by Francis Sooho Kim (프란시스) of DNPD (DN Producing Department). Listen to Sun by DNPD’s Francis at YouTube. Ok 용길 내서 말해 볼께 baby. Ok yong-gil naeseo malhae bolkke baby. I can be only one! Only one. 옆에 그 사람 보다.. 더..
yeop-e geu salam boda.. deo..
One One two two one two step. I can be only One. It’s true. I got my love and my 2 step. I got chu and my 2 step.